Wish you all a very very Happy and a safe Deepavali... or Happy Diwali. 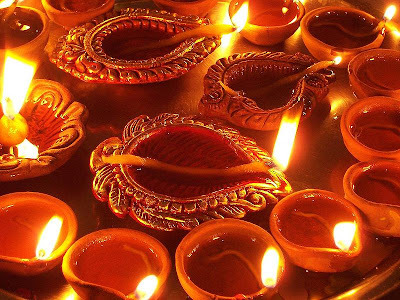 Deepavali is a Sanskrit word - Deepa meaning light and Avali, meaning a row. It means a row of lights and indeed illumination forms its main attraction. It symbolises that age-old culture of India which teaches us to vanquish ignorance that subdues humanity and to drive away darkness that engulfs the light of knowledge. Deepavali, the festival of lights even to-day in this modern world, projects the rich and glorious past and teaches us to uphold the true values of life. To read more on this, please click here. In the north of India, the same festival is known as Diwali. In this board, I have simply used a traditional south Indian saree as my inspiration to decorate my house for Deepavali.....Please share some of your ideas or pictures here. 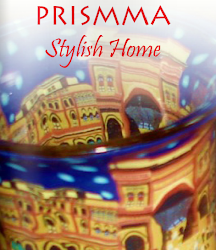 Labels: Deepavali home decoration, saree inspired festival decoration. Love the use of that saree... truly inspiring. 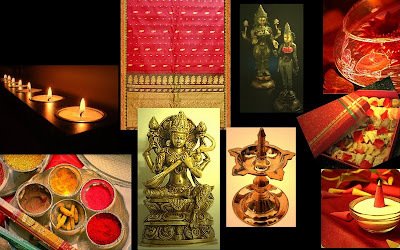 Happy Diwali to you too Vasu..
such beautiful rich reds, and the light reflecting off the metal (brass?) is so warm. lovely. Thanks for stopping my blog-Cherishing Spaces has some amazing ideas! Loved the decor idea vasudha..happy diwali! Hi Vasu, i picked up a bottle green banaras saree from the suday bazaar.. but now dont know what to do with it.. any ideas? ?